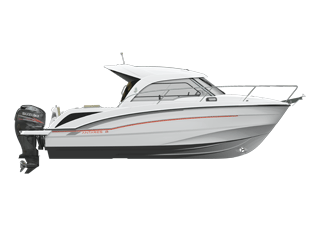 The Antares 8 is fitted with a Suzuki engine and enjoys a propulsion power of up to 200 hp. Single outboard engine - maximum power 200 HP. Sliding hatch on wheelhouse for good ventilation, single-piece windscreen for better visibility. Large forward double berth: 6'7'' x 3'' hanging locker. Small galley: 42 L icebox (option refrigeration), sink, place for hob. U-shaped saloon seating 4 people. Converts into double berth (2 m x 1.27 m). Steering station: panoramic windshield, flush engine control, space for electronics, bolster function seat. Copilot seat : 2 positions. Separate bathroom (marine or chemical toilet on option) and stowage.